In July of 1814, two armies met in bloody battle at Lundy’s Lane, just across the Niagara River from New York in Canada. By midnight more than one in four of the 6,000 American, Canadian, and British soldiers were casualties. Although a small skirmish in comparison to other battles waged worldwide by the British, by holding the line at Lundy’s Lane, Great Britain guaranteed Canada would remain part of its empire. 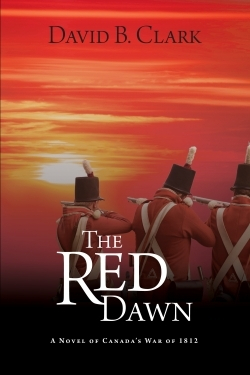 David B. Clark’s The Red Dawn is the story of that small but savage clash of arms and of the campaign fought in the narrow peninsula between Lake Ontario and Lake Erie from 1812 to 1814. Although billed as a novel, there is far more history than fiction here. The book opens with a narration by Samuel Clifford, a Harvard student born in upstate New York who becomes swept up in the heady revolutionary excitement of Boston between 1774 and 1775. He joins George Washington’s army to fight the British, only to learn a few years later that his parents, accused of being loyal to the Crown, have been killed by American patriots. Clifford deserts in fear and anger and flees with other Tories into what will become the new province of Upper Canada. At this point in the narrative, the focus and tone shift dramatically. For the next 350 pages, Clifford becomes a bit player and the book might best be described as a slightly novelized military history of this particular front in the War of 1812. The Red Dawn is Clark’s sixth book. A Canadian doctor and former army medical officer, Clark’s deep appreciation and abiding interest in the military history of his country is evident. In telling the story of the War of 1812 from the Canadian point of view, Clark does his countrymen proud and offers his neighbors across the border a unique perspective on one of America’s least popular and most controversial wars. Clark intersperses his tale with characters and caricatures, some historical and others a composite of the men and women involved in the struggle to hold their small plot of farm and woodland for king and country—and for themselves. The cast includes the requisite heroic soldiers, idiotic generals, and more than a few brave men who die noble deaths. It is standard war novel material, but it is well-written, solidly presented, and strongly founded upon the campaigns and battles, uniforms and flags, and tactics and weapons of the period. The Red Dawn is an exciting work of historical fiction. The book is so filled with descriptions of raids, patrols, skirmishes, battles, sieges, and their aftermath that even the most ravenous consumer of war novels will not leave hungry.